Can I not have an option to ‘Check for Updates’ for the template, instead of starting a fresh new PowerPoint and importing the slides over? 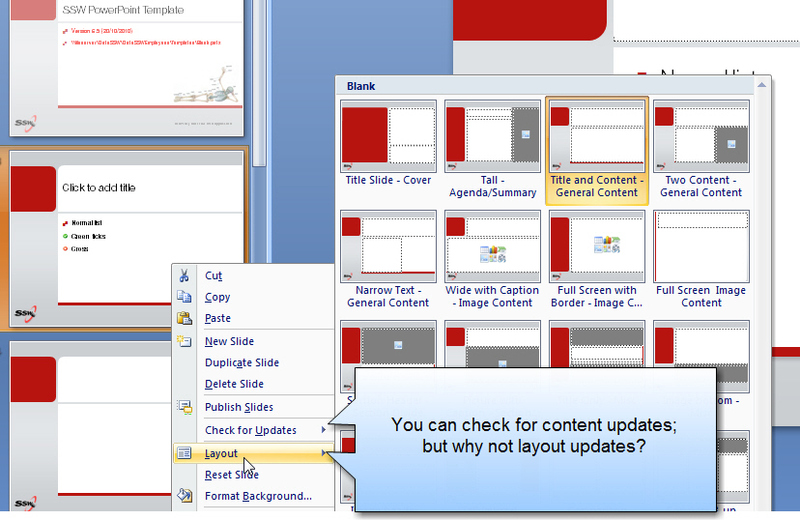 Figure: Why can’t we check for layout updates? We have a Rule on using ticks and crosses for bullet points but currently we have to map to an image as a bullet point and it is a long, frustrating process. Why not have default ticks and crosses available? The disabled options have me confused? I can see that those toolbar options are disabled (below) but I cannot see the reason. Figure: Why are these options in the toolbar disabled? Microsoft Word currently supports attaching captions to embedded images, as seen in the following screenshot. This cannot be done with embedded images in Microsoft PowerPoint, however. It would be useful if users could add captions to PowerPoint images as well.